Eight years ago, two health journalists – Ivan Oransky and Adam Marcus – wrote their first blog about the retraction of journal articles. One of the papers they highlighted was published by Anil Potti of Duke University who “invented key statistical analyses in a study of how breast cancer responds to chemotherapy,” a revelation that sent shockwaves through the cancer community. 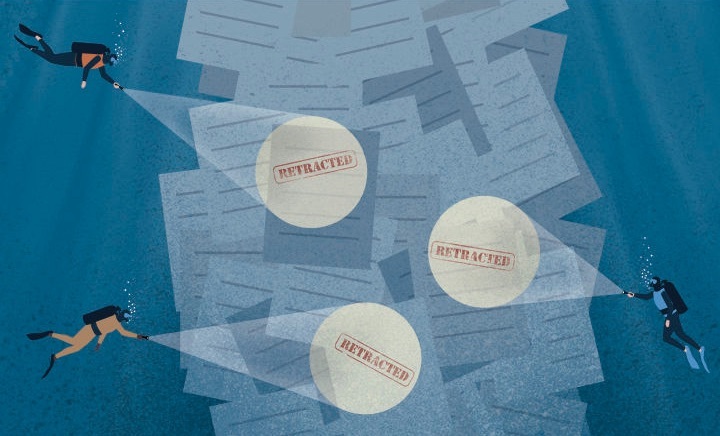 Yesterday, Retraction Watch announced that it was launching a database of more than 18,000 retractions, highlighting its collaboration with the magazine Science that featured five articles on the topic published today (click here to download). 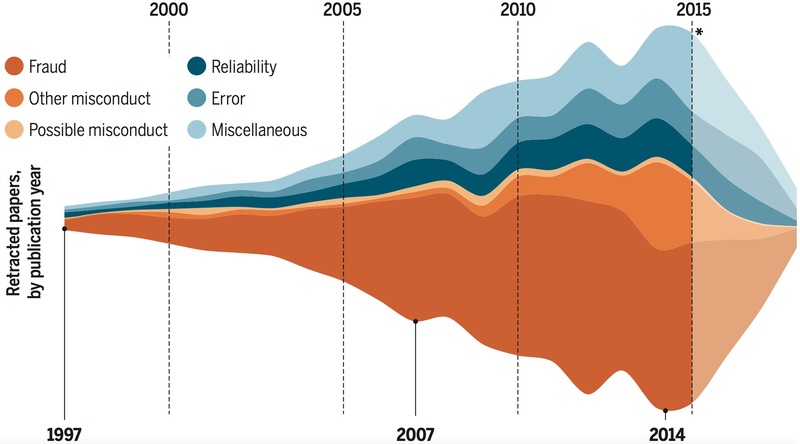 Click on the diagram at left (© AAAS), to see that the majority of retractions have involved scientific fraud – fabrication, falsification and plagiarism – and other types of misconduct such as fake peer review. This latter phenomenon, which is of relatively recent origin, occurs when authors provide the journal editor with an e-mail address they control, enabling them to review their own manuscript! An increasing proportion of retractions have involved plagiarism that is thought to be the result of an internet-based service called iThenticate. Alison McCook highlighted the fact that one publisher – the Institute of Electrical and Electronics Engineers (IEEE) – has been responsible for more than 7,000 retractions, most of these being abstracts for IEEE conferences. Interestingly, most of the authors are based in China, with topics covering the physical and social sciences. Marcus described how a single scientist with over 90 retractions – Joachim Boldt from Germany – whose fraudulent research supported the effectiveness of an intravenous solution to control blood pressure, had placed patients’ lives at risk.